The well-proven UOE process incorporates the world’s strongest edge forming and “O” press combinations. 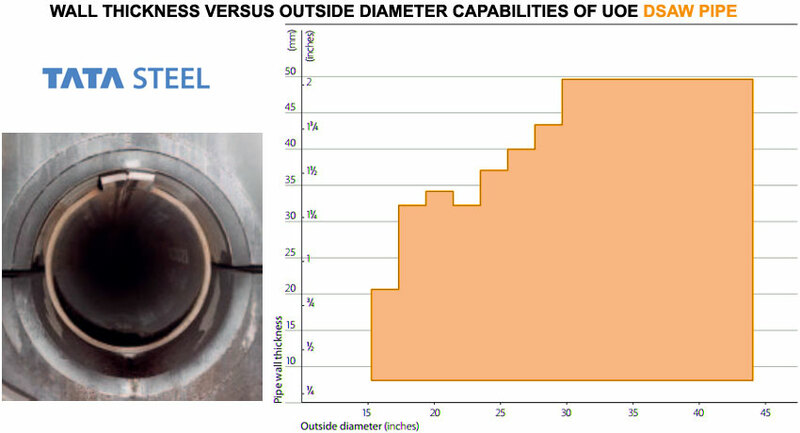 This allows to produce high-performance thick-walled pipe from 16 inches to 44 inches outside diameter. The process also maintains the tightest tolerances – resulting in linepipe that offers distinct project advantages. TATA Steel is a world leader in pipelines expertise from collapse resistance pipelines for deepwater application to reeled DSAW pipelines (a world first) providing a premium solution and a lower total cost of ownership for your project when compared the seamless pipeline options. TATA Steel's UOE DSAW mill process ensures pipe properties suitable for most pipeline applications including deepwater scenarios. Following double submerged arc welding, pipe is mechanically expanded and can be produced in a wide range of sizes. 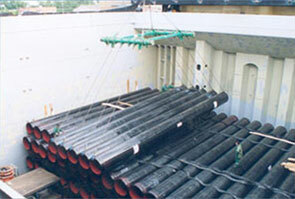 We are the only European manufacturer capable of offering both 16 inch and 18 inch DSAW pipe. With the option to source plate either from Tata Steel’s own plate mills or from other quality suppliers, Tata Steel is able to provide the best technical solution to meet customers’ bespoke project requirements. This top quality feedstock and the achievement of extremely tight tolerances for circumferential welding contribute to the outstanding performance of our end product. Weld seam ultrasonic testing and x-ray radiography (prior to expansion and post-expansion) are among a battery of tests incorporated in the process. 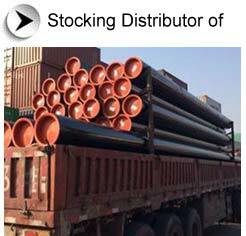 Aesteiron has sales Representative & Stockyard in Netherlands, Venezuela, South Africa, Indonesia, USA, UAE & Australia, in our UAE stockyard we have ready stock of API 5L DSAW Pipe,x52 pipe, x42 pipe, x70 pipe, x65 pipe, x60 pipe, x56 pipe, x80 pipe, psl2 pipe, ERW Steel Pipe, LSAW Steel Pipe, Seamless Steel Pipe, P22 Pipe, sa213 t11, S/A 53, API 5L Line Pipe & A 106 Grade B Pipe of world's renowned manufacturers like Tenaris / Dalmine-Italy,Vallourec-Europe, Vallourec Star-USA, Productos Tubulares-Spain, Jiangu Chengde Steel Tube-China, Tubos Reunidos-Spain, Chomutov-Czech Republic, Huta Batory-Poland, Siderca-Argentina, Mittal Steel-Czech Republic Romania, NKK/ MSL -India / Tenaris Japan, Volzhsky Russia, Tamsa-Mexico, Productos Tubulares-Spain, Niko Tube-Ukraine, Heng Yeng-China, Lubao Steel China Suzhou Seamless-China and YYC-China etc. 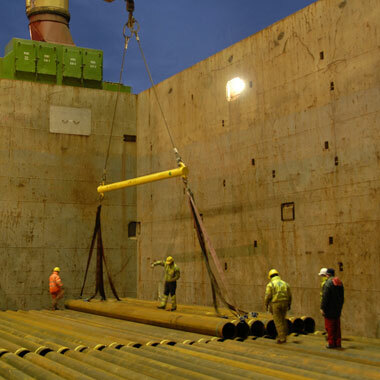 TATA Steel's extensive non-destructive and ultrasonic testing capabilities for DSAW pipe. Our products also offer the benefit of total traceability. This means customers can be confident in installing our line pipe in the harshest environments around the world. 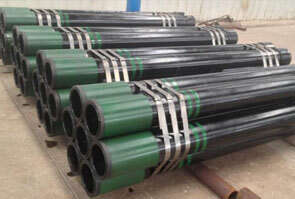 Each API 5L DSAW Pipe is marked with tube type, heat number, steel grade and size. Other markings, such as stamping, can be made on request. As we are supplying api5l grb & API 5L DSAW Pipe globally so we have our dedicated sales representatives & technical consultant engineer in Nigeria, South Africa, Australia, Italy, Iran, Iraq, Israel, Turkey, Spain, Indonesia, Saudi Arabia, Oman, Qatar, Kuwait, South Korea, Canada, Japan, Yemen, Netherlands, Singapore, Malaysia who can provide you detailed information about API 5L DSAW Pipe & comparison with other grades which will help you to choose the right steel pipe for your project at lowest price available in the market. For free consultancy or technical query you can send mail to our technical experts.